The LASP instrument, known as the SUrface Dust Mass Analyzer (SUDA), will be used to measure the composition of solid particles released from Europa’s surface due to meteoroid bombardment. The instrument also will be able to measure the properties of small, solid particles believed to be spewing from a hidden ocean within the moon, said LASP research associate, Sascha Kempf, who will serve as principal investigator on the project. There is evidence from both NASA’s Galileo mission to Jupiter and from Hubble Space Telescope images that plumes of water and ice particles are shooting out from Europa’s surface, according to NASA officials. 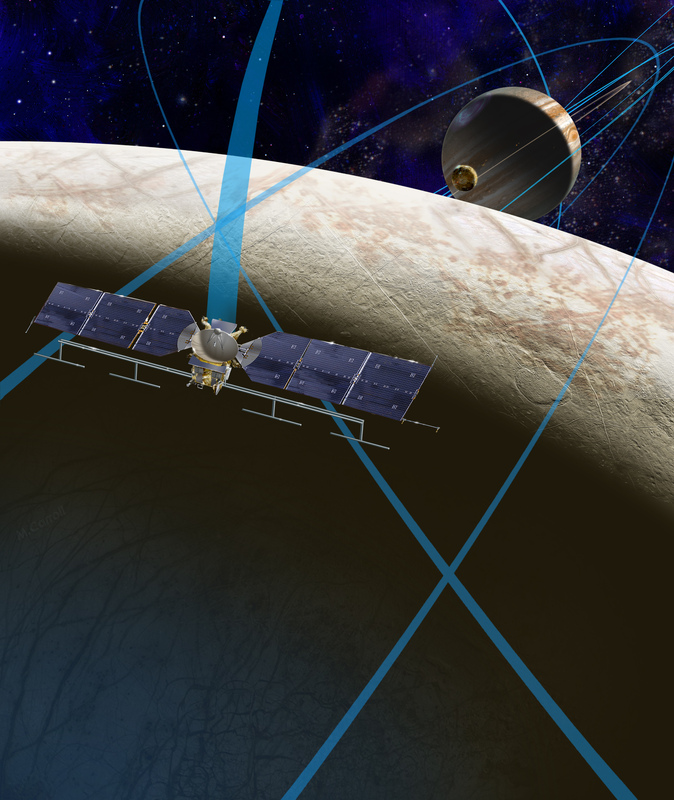 SUDA was one of nine instruments selected today by NASA for the mission to Europa from 33 proposals from around the world. LASP co-investigators on the instrument—which has been under development for about 10 years—include CU-Boulder physics Professor Mihály Horányi and CU-Boulder aerospace engineering sciences Assistant Professor Zoltan Sternovsky. Europa is one of four large Jovian moons and is about the size of Earth’s moon. Scientists believe there is a frozen crust about 40 miles (70 kilometers) thick separating the ocean from the surface, said Kempf. The ocean, which may be heated by Europa’s interior, could harbor more than twice as much water as Earth’s oceans, NASA reported. NASA’s fiscal year 2016 budget request includes $30 million to formulate a mission to Europa. The solar-powered spacecraft would be placed in a long, looping orbit around gas giant Jupiter—the largest planet in the solar system—performing approximately 45 flybys of Europa over a three-year period at a distance as close as 16 miles (25 kilometers). In March, a CU-Boulder-led study involving Kempf used data from NASA’s Cassini mission indicating microscopic grains of rock detected near Saturn may be due to hydrothermal activity taking place within its moon, Enceladus. About the size of a lunchbox, the LASP instrument for Europa will weigh about 24 pounds, much of it for special high-tech shielding to protect it from the harsh radiation environment of Jupiter. LASP also has a dust instrument on NASA’s New Horizons mission to Pluto called the Student Dust Counter built entirely by students. Launched in 2006, New Horizons will make its closest flyby of the dwarf planet on July 14. Other U.S partners on the SUDA project include Arizona State University and NASA’s Jet Propulsion Laboratory in Pasadena, California. In addition, there are several European partners including the University of Stuttgart in Germany, the University of Oulu in Finland and the National Center for Scientific Research in France.